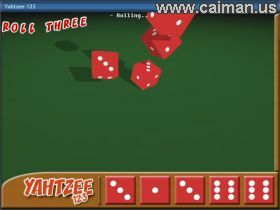 Caiman free games: Yahtzee 123 by Robin Biddlecombe. This is well (or not sore well) know game's with dices Yahtzee computer version. It has nice graphic easy to use menus and if you know all rules or played not computer version of this game you should enyoy it. 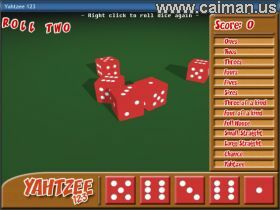 The aim is to get the highest score by rolling combinations of dice. At the start of each round, five dice are rolled. You may 'hold' however many dice you want. Once you have chosen which dice (If any) you want to hold, the dice are rolled again. If you have held a die, this die is not rolled again. After the third roll, you have to choose one of the score slots which you are going to use. You will receive the numerical value of the slot multiplied by the number of dice of that number you have, for example:If you have three fours, and you choose the fours slot, you will receive 3x4 points = 12 pointsIf you have five sixes, and you choose the sixes slot, you will receive 5x6 points = 30 points. If this slot is chosen and you have three or four of one value of a dice, the score you will receive will be equal to the total of all of your dice. For example:If you roll 6,5,6,6,1 you have three sixes, and so you can use the 'three of a kind' slot. The score you get is equal to the total of all your dice, which is 24.If you roll 1,1,1,1,5 you have 4 ones, and so you can use the four of a kind slot. The score you will receive will be 9. This simply adds up the total of all the dice rolled and adds it to your score, regardless of the numbers rolled. For example:Rolling 5,6,3,4,5 would give you 23 points. This is when you get five of the same number, and you are rewarded with 50 points. For example:Rolling 1,1,1,1,1 would give you 50 points. If the total of the points scored from the ones, twos, threes, fours, fives, and sixes is 63 or more, a bonus 35 points is given.If more than one 'Yahtzee' is achieved, a bonus 100 points is rewarded per extra yahtzee.